You’ve probably heard it mentioned over the last few years, but have you nodded knowingly and really thought, what is ‘the Cloud’? You may not know what it is, but you’re probably already using it – Facebook, Pinterest, Twitter, web-based email services like Gmail, Hotmail, and Yahoo, photo sharing sites like Snapfish, all store information in the ‘cloud’. The cloud simply refers to lots of large computers (servers) all over the world where you can store data that you would have stored only on your computer in the past. It’s a virtual place on the internet where different types of data can be stored and then accessed by different devices, like computers, tablets and smartphones. 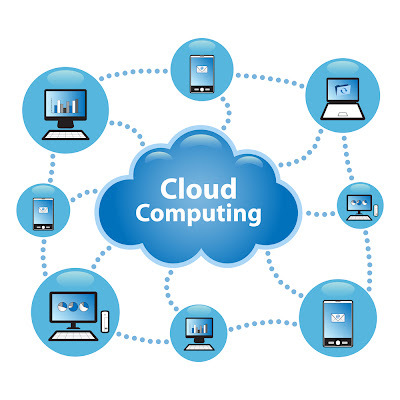 If you use any application that you have access to (usually by login & password) on multiple devices and that is able to sync between them (keeps them all updated with changes regardless of which device you made the change on) then you are using cloud computing. You can also give others access to your data on the cloud by ‘sharing’. That’s what happens when you make your Pinterest or Springpad boards public. I’ve written posts about a few apps that are cloud based – Wunderlist – Springpad, and there’s more coming in the next few weeks. If you store all your files, pictures and music just on your computer it can take up a lot of space on your hard drive; years and years of photos and videos can really slow your computer down; and you can only access them when you are at your computer. Apart from individual cloud based apps, you can also use the Cloud to store your files, enabling you to work anywhere, on any document, on any device, as long as you have an internet connection. Even if you have files scattered on your home computer, iPad, smartphone and a laptop, by using cloud storage, your files are shared and automatically synced across all your devices. You can use Cloud Storage to store your data in a remote location and then access it using an application called a ‘client’ on your computer, tablet or smartphone. Some of the major Cloud storage providers are Microsoft SkyDrive, Google Drive, Apple iCloud, and Dropbox. Your files, pictures, videos and music are all automatically synced so that both the server and all your devices are up to date at all times. Cloud storage is often used for file backup, instead of (or as well as) backing up to an external hard drive or USB. Or, if you need to access a document when you’re away from your main computer, there’s no need to save a copy to a USB stick – you can access all your files as long as you have access to a computer and an internet connection - the library, an internet café, or your sister’s computer while you’re visiting her on the other side of the world! And not just ‘access’ your data, but add to it too. You can use the cloud when you upload photos while you are travelling around the world. Your photos are instantly synced and your family can see what you’ve been doing by accessing the album you have ‘shared’ with them on the cloud. This week I’m going to be posting all about the Cloud. Today was your introduction. During the week I’ll be posting about some of the popular cloud storage services; safety and security when using the cloud; uses for the cloud you may not have thought of; lots of great cloud based apps; and more…..